This is a wooden octagon display case. This case has a black finish which will blend well with most decor. The countertop design is great for showing off products conveniently for your customers. 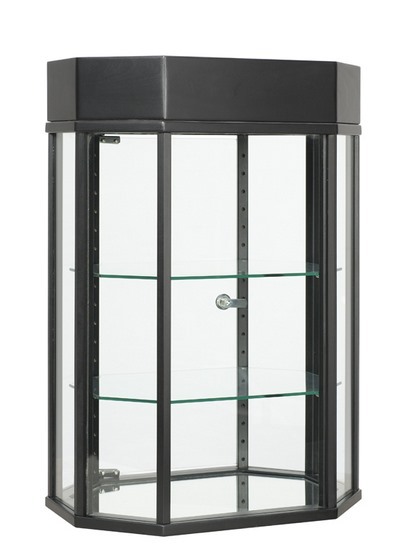 This wooden octagon display case has an extremely stable and durable construction. There are two adjustable shelves both of which are tempered glass. A locking door keeps all of your items safe from theft. There is a mirror deck in this display case to help reflect ambient light. Lights: (1) 50 watt halogen lights. The built in 50 watt halogen light in this octagon countertop case keeps your products properly illuminated at all times. You never have to worry about depending on ambient light. We also build custom countertop wood display cabinet if this design does not fit your requirements exactly. Click here to view the full line of custom finishes we have available for this counter top display cabinet.